You don’t have to know how to play piano to have fun with a Casio keyboard, a fact that seemed especially true in the 1990s. This was the era when it appeared that every boy and girl in the United States received some variation of the instrument for Christmas, each one dotted with purple and green buttons that emitted a variety of stock beats when pressed. (Does anyone else remember the especially porny-sounding instrumental of “The House Of The Rising Sun”?) Even the most musically inept kid on the block could cobble together a composition that, if not technically impressive, was at least entertaining. If they were feeling especially adventurous, they might even press a random note to switch keys or throw in some canned animal noises. In December of 2000, not long after one of Casio’s most glorious decades ended, Saturday Night Live turned this sense of nostalgic playfulness into a seemingly dispensable novelty song. The joke, of course, was that it still didn’t sound that different from a bunch of kids horsing around in the den, basement, or music room. In fact, the most professional thing about the segment was the intro: “Season’s greetings from all of us here at Saturday Night Live,” announces Don Pardo over a Christmas card graphic printed with faux-Old English-style letters. 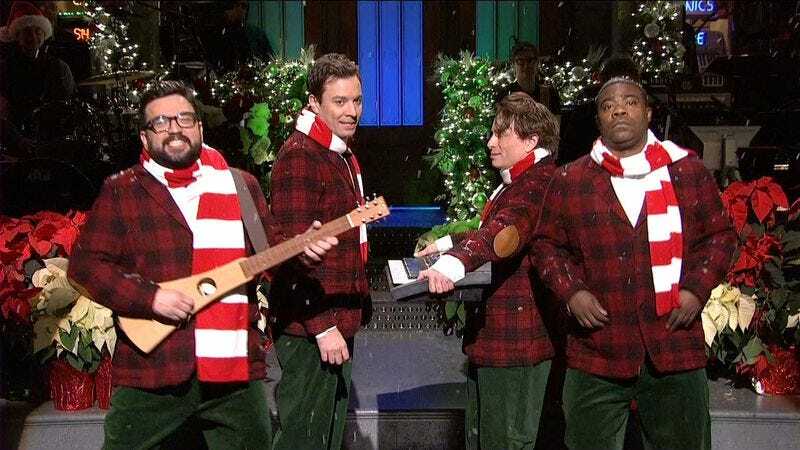 Dissolve to Horatio Sanz, Jimmy Fallon, Chris Kattan, and Tracy Morgan wearing sweaters, sandwiched between two Christmas trees, their grave faces about to be offset by pure, unadulterated (emphasis on the “unadult”) silliness. Artificial snow sprinkles onto their heads, prompting Fallon to hit a beat on his keyboard. But rather than use an actual keyboard stand, he merely has Kattan hold the instrument. That might be the most important visual gag of the evening. Then those boneheaded drums kick in. Despite this being a comedy show and not a proper concert, they don’t sound all that different from the percussion on any ZZ Top record from the 1980s or the Brothers In Arms album by Dire Straits. Sanz plunks out a preschool guitar riff, a tinny melody grates away, and all four men dance with an awkward rigidness that usually only works in Peanuts cartoons. And just like that, SNL mined another profitable nugget of comedy gold. The audience’s initial silence soon gives way to laughter because many of them have probably seen this sort of thing before—the flubbed notes, the MIDI file rendered even more laughable by a key change, the inexplicable elephant trumpeting. The only difference is that the crowd’s used to seeing such amateur ditties performed by kids at home, not full-grown men in front of a nationally televised audience. You could call it genius absurdism, or you could call it what it is: four comedians channeling their inner middle-schoolers—and having the time of their lives while doing so. The following year, the guys dressed as Christmas toys as they performed. Then, after Fallon, Kattan, and Morgan all left the show, Jim Henson’s Muppets filled in for the departed alumni, with Animal nailing Kattan’s rhythmic head-turns (just with a toothier, dopier smile) and The Great Gonzo poking fun at how popular the song had become: “You’ve sung it like three times a year for the last four years,” he quipped to Sanz. But a holiday song doesn’t become a true standard from change alone; it also needs to be covered by someone else—someone not made of felt. That very thing happened to “I Wish It Was Christmas Today” when Julian Casablancas recorded it as an iTunes/Amazon bonus track for his solo debut, Phrazes For The Young. Although the childlike lyrics remain intact, they don’t sound quite as whimsical when filtered through new wave keyboards and The Strokes frontman’s chilled-over baritone, which escalates to an enthusiastic bark by the end. Likewise, the galloping drums and handbells add celestial maturity, the same way Frank Sinatra transformed the toy parade of “Santa Claus Is Comin’ To Town” into something positively swinging and regal. Things came full circle in 2009 when, as host of Late Night, Jimmy Fallon merged the original version of the song with the most recent one. It begins like it did in the old days, with him on keyboard and Sanz on miniature guitar. When that first elephant call rings through the air, however, actual drums shake the stage and the camera pans over to Casablancas bending into the mic as The Roots thunder forth with the more muscular arrangement from his album, now lifted higher than ever by horns and stacks of synths. But even as the ditty becomes a bona fide rock hit and Questlove does a much cooler take on Kattan’s head-swing, Sanz’s juvenile guitar lick shines through it all, a testament to “I Wish It Was Christmas Today” functioning as both novelty song and holiday powerhouse. Aside from a handful of terrible karaoke tracks on Spotify, it sadly hasn’t been recorded in earnest since 2011, when the original foursome reunited on SNL with Fallon as host. The lack of superstars who have tackled the material is understandable, given how hard an act Casablancas and The Roots are to follow. But maybe there’s a future rock star out there in some suburban basement, tinkering with their parents’ old Casio and experimenting with those animal noises. Maybe they’ll fall in love with “I Wish It Was Christmas Today” as a comedy song before eventually recording it with a straight face. But like Casablancas, hopefully they’ll always play it with a slight (and childish) grin underneath.